Print shops face a lot of challenges in giving their customers what they need. That’s especially true when it comes to vinyl sign printing. What can shop owners do to avoid common mistakes when it comes to printing vinyl banners and signs? Show your banner design to several people for proofreading before you print. This will help you locate any spelling or grammar mistakes that would otherwise slip by. Minor spelling mistakes are common, and make your company look unprofessional at best. Keep an eye out for words that are commonly confused (e.g. their, there, and they’re) as well as commas, apostrophes, and other punctuation that can change the context of your message when misused. A similar approach should be taken to visual design. Are your fonts clear and well kerned? Are your images color-correct and effective in conveying your message? Avoiding these problems before you print saves time and money. When it comes to color models, the same principles apply for vinyl sign printing as they do for large-format paper printing. If anything, the difference can be more important, as vinyl printing can be finicky about color boldness, and sunlight will eventually dampen boldness further. When you consider how outdoor banners are used, the science behind the differences makes sense. RGB is an additive color system, by which light is mixed together — in this case, on your computer monitor — to create all the colors you see. The more light you add, the more vibrant your colors become. By comparison, CMYK is a subtractive color system, in which ratios of colors are subtracted away from pure black to create tones. The more medium you add — in this case, ink — the darker your tones. When you neglect to convert your design files into CMYK, the differences between these two can result in darker muted colors, which can make an outdoor banner more difficult to read. Delicate fonts that look great on your computer screen won’t always translate well to vinyl print. That’s because they aren’t meant to be read at a distance, which is usually the motivation behind getting a vinyl banner printed. In many instances, printer ink doesn’t stand out well against vinyl material, especially when using darker colors and cheaper materials. Adding a little extra boldness to your font choice ensures it will be easily legible from a distance. The bleed on your banner is especially important when your design involves graphics that extend to the end of the printed surface. Adding a bleed to your visuals ensures that your printer will properly align and space your banner when it comes time to print. Designs that don’t include a bleed run the risk of coming out lopsided or cut off, leading to costly and frustrating reprints. High-quality materials may cost more, but they pay out in better results and happier clients. Selecting print media that accepts ink willingly, stands up to the production process, and doesn’t curl is key to getting good banner results. Curl-free vinyl banner material is an often overlooked component that can make a big difference. Banners are supposed to lie flat or hang without curling on the edges. 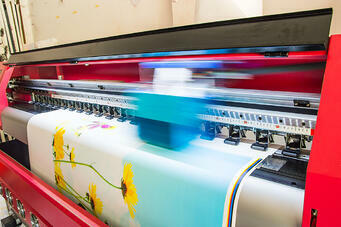 Choosing a high quality banner media ensures that the job gets done as intended. Curl-free material is especially important for retractable and seasonal banners, which spend much of their life rolled up. Check for ink compatibility between your banner media and the printer you’re going to use. Most inexpensive options aren’t ideally suited for all inks, especially eco-friendly and UV curable inks. Many banner materials don’t work with latex printing at all. Good materials are widely compatible, and manufacturers will let you know what they work best with. High quality media should be flame resistant, too. Printing vinyl banners requires a heat element that isn’t great for low quality imported media. Cheap vinyl banner media is usually screen grade, which has a soft hand — i.e. limp and flexible. Screen grade isn’t designed for roll-to-roll digital inkjet printers that pro shops tend to use for vinyl banners. When used, it usually results in tracking issues, wrinkling, jamming, and head strikes from poor feeding. The higher the temperature, the softer your imported vinyl media becomes, which only multiplies these problems. When selecting a banner material for your shop, choosing a high quality vinyl that’s designed for professional-grade printing is crucial. Texture is especially important for vinyl printing. Dot gain is a term to describe the texture on the surface of vinyl media, specifically as it relates to ink spreading. Higher dot gain is needed for screen-printed banners to ensure that ink evenly covers the surface of the banner, but it looks bad when processed using modern inkjet printers. Most cheap media from overseas is screen grade and therefore comes with a higher dot gain that looks bad on professional printers. The reason these mistakes are common is because they’re easy to make. They are also easy to remedy with a little planning and a healthy dose of knowledge. Want to learn about techniques used in banner printing. Download our free whitepaper today!